The famous Cours Saleya Brocante and the vast Antique District around the Nice Port, are the best places to find some hidden treasures and unique home furnishings! The Antique District in the Port boasts over 100 antique stores making it the 3rd largest cluster of antique dealers in France. You’ll follow in the footsteps of the last 50 years of Antique Dealers, wandering the endless back streets and discover extraordinary antique shops of all prices and quality. 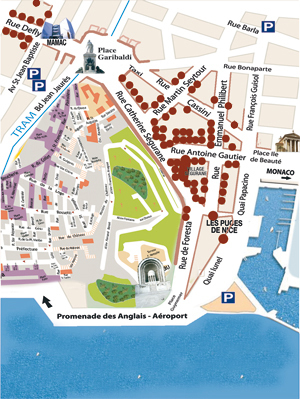 There are so many shops that you practically need a guide, so luckily you can find a handy street-by-street listing at Promenade des 100 Antiquaires, with links to the individual shops. Most stores are closed Sunday and Monday, and many close at lunchtime. Don’t miss The Puces de Nice, an open-air collection of 30 covered stalls filled with attic treasures. Located on Quai Lunel, on the Nice side of the Port. On the third Saturday of each month, the Antiquaires of the Port haul their best bargains out to the nearest town square, taking over beautiful Place Garibaldi to hold an all-day open-air Brocante. The famous weekly Cours Saleya Brocante in Old Nice is a Monday magnet: Antique fans come from flooding in from Italy, and antique dealers come from all over the coast. …and in various other villages: click here for a list. While the Port Antique District and the various brocantes present an easy way to cover a lot of ground, there are antique shops all over Nice. Previous articleAstonishing Success for the artist Cesare Catania on The French Riviera. Next articleWhy Start a Business in Monaco? The Fact Sheet.